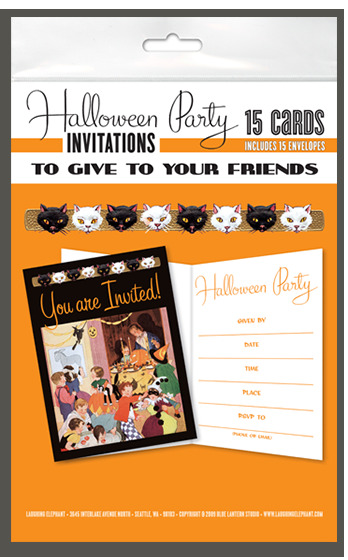 Halloween parties are an opportunity to show off innovative costumes, elaborate decorations and whimsical food and beverages, and the wise host or hostess will want to honor this outpouring of creativity with a beautiful invitation. Halloween parties are an opportunity to show off innovative costumes, elaborate decorations and whimsical food and beverages, and the wise host or hostess will want to honor this outpouring of creativity with a beautiful invitation. While email is convenient, a proper party invitation summons your guests with a dash of ceremony along with the relevant information. Our party invitations packet features a charming illustration from the 1930's and is suitable for children or adults.